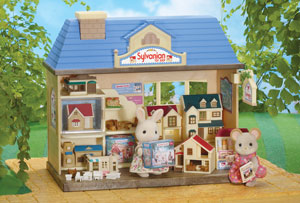 Now there is a wonderful new Toy Shop open in Sylvania where all your characters can shop for their own Sylvanian Families to play with! The shop includes replicas of lots of Sylvanian homes and buldings, along with boxes, magazines and tiny furniture to go in the houses. How delightful!